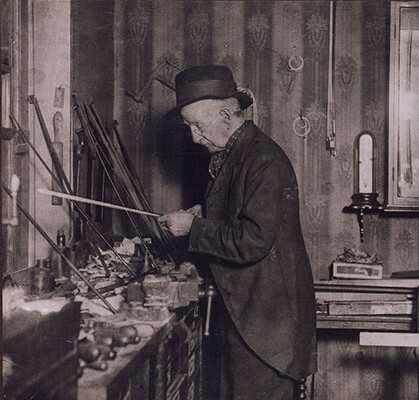 James Tubbs was one of the finest and most prolific bow makers in the history of British violin making. His work rivals that of the finest French makers, and he is said to have made thousands of bows in his lifetime. Initially Tubbs trained with his father William before starting his own business in the 1850s. He collaborated ...Read More with William Ebsworth Hill starting around 1858, but never appears to have been officially employed by Hill or the Hill firm. In fact, after their relationship deteriorated steadily and eventually foundered in 1870, whenever Tubbs came across an example of his own work bearing a Hill brand, he stamped his own name on top of it, either " J. Tubbs" or "Jas Tubbs." - The auction record for this maker is $43,760 in Mar 1995, for a violin bow. - 1031 auction price results.